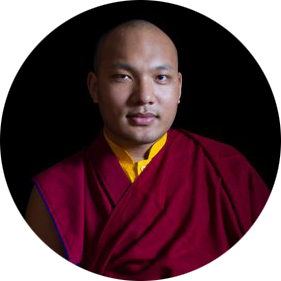 His Holiness the 17th Gyalwang Karmapa departed New York City today to make his way to his North American seat, Karma Triyana Dharmachakra (KTD), in Woodstock, NY. KTD was founded by His Holiness the 16th Gyalwang Karmapa, Rangjung Rigpe Dorje. En route to his historic first landing at KTD, His Holiness visited Kagyu Thubten Choling (KTC), the retreat center led by Lama Norlha, a master in the lineage of the venerable Kalu Rinpoche. KTC is located in Wappingers Falls, NY. At KTC, His Holiness received mandala and body, speech, and mind offerings from Lama Norlha and his students, gave a welcome address to the KTC community, consecrated a recently constructed stupa, visited with the male and female dharma practitioners currently immersed in the traditional three-year retreat, and blessed the site of an additional monastery building to be constructed on KTC’s grounds. When he arrived at Karma Triyana Dharmachakra, His Holiness was greeted by a full and colorful welcoming procession complete with all of the traditional musical instruments of Tibetan ritual. After he ascended the throne in the beautifully appointed shrine room, His Holiness expressed his great delight in the excellent work of Bardor Tulku Rinpoche, Khenpo Karthar Rinpoche, President Tenzin Chonyi, and the many others whose service to the Gyalwang Karmapa caused the continuity of the Karmapa’s teachings to thrive at his North American seat. His Holiness will spend the next several days at KTD, giving teachings, granting empowerments, and meeting with members of the KTD community.